Please refer to our stock # 1-0357 when inquiring. 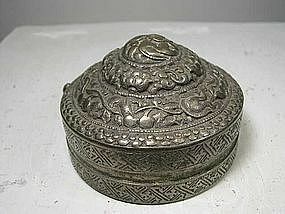 Lime box of round shape, its lid with embossed decor of the Buddhist Wheel of the Law on top, foliage design under it, surmounting a series of dragons in clouds below, the whole on an elaborate tiny lotus decor. The sides of the lid are decorated with a geometric incised design of a cross and a kind of Greek key. The sides of the body of the box are also decorated with this cross and Greek key design. Beneath the box, an incised decor of Buddhist svastika and flowers. Two small loops for attachment at the side of the lid and the box. The piece is made of white brass. Remnants of lime inside. Fine patina. Tibet, 18th century. Diameter: 3" (7,5 cm). Very good condition. Silver Lime Box, Tibet, 19th C. Tiny Statue of Adibuddha Vajrasattva, Tibet, 19th C. Important Mask of Mahakala, Bhutan or Tibet, 18th C.